Secretary-General Ban Ki-moon (centre right) meets with François Hollande (centre left), President of France and Laurent Fabius (right), Minister for Foreign Affairs of France and President of the UN Climate Change Conference in Paris (COP21) prior to “Comité de Paris”: Presentation of Draft Outcome Document at the COP21. The Paris Agreement has been adopted! Emotions ran high at the La Seine plenary hall. Delegates cheered, hugged, some wiped off tears – it was a joyous occasion. As French President Francois Hollande told delegates: You will remember that you were here on 12 December, and that you made history with this agreement. You can read the final version here. What was now unthinkable, is now unstoppable. Well done to all the governments, civil society and businesses who have worked so hard to do their part and make this agreement possible. The new text is ready. Read it here. Well that was exciting. COP21 President Laurent Fabius presented the new document to delegates, which should be available around 1:30 pm. Is it really our last day at COP21? It is starting to look like it. Last night in an impromptu statement to the press COP21 President Laurent Fabius said he would present what he called the “final version” of the text. That time has since moved to &ampampampampltspan style=”text-decoration: underline”&ampampampampgt11:30am&ampampampamplt/span&ampampampampgt. Once the text is presented delegates will have some time to review, and if all goes well, they will adopt the text after that. But how long will this take? That is still unknown. Stay tuned. How many meetings can you fit in one day? Secretary-General Ban Ki-moon today met with ministers from South Africa (top left), Singapore (top right), Australia (middle right) and Turkey (bottom right). He also met with U.S. Secretary of State John Kerry (middle left) and the Presidential Commissioner for Climate Change of Venezuela. Not pictured: The Special Representative on Climate Change of China. In between meetings with high-level officials, Mr. Ban took his lunch break today with COP21 participants in a cafeteria at Le Bourget. It was a long night for delegates who at 9pm last night received a new version of the text and then broke into groups for consultations. You can feel it in the atmosphere – time is running out. COP21 President Laurent Fabius has said negotiations may not finish until tomorrow morning. You can read the new version of the text here. I respect, honour and commend your commitment to protecting the environment that sustains us and creating a world of hope and opportunity where no-one is left behind. After Paris is over, your voices will be needed more than ever. I urge you to continue to demand more from all Governments. Show us what is possible. Delegates have now been presented with a new draft. They will study the document and begin consultations immediately. The meeting of the Paris Committee is set to adjourn at 8pm. The new draft is now 29 pages, down from 43. You can read it here. Every day, bakers at COP21 make more than 10,000 croissants to feed the 45,000 participants at the conference. There are “recycling guides” throughout the conference centre, usually wandering around near the recycling bins telling people how to separate their trash. If you””re lucky, you can grab free organic apples, fair trade and carbon neutral chocolate, and Ben &ampampampampampampampampampampampamp Jerry””s ice cream. This last one has its own COP21 flavour “Save our Swirl” which is raspberry with chocolate chunks. All delicious and sustainable treats. Another less conventional snack at the COP – insects. We saw these pop up at the Espace Generation Climat, and then again being offered at a dinner for delegates. There are also a few relaxation rooms, which we think are there for delegates running out of energy. They may come in handy pretty soon. Finally one of our favourites, was the bike for juice stand, which requires you to bike until you””ve created enough energy to power the juicer. The Change Chocolate supports an afforestation project. One of the COP21 bakers. Pedal for juice and calculate your energy equilibrium. Negotiations update: The Comité de Paris meeting has now been rescheduled from 1pm to 3pm. We””re reaching the homestretch. As COP21 President Laurent Fabius said, delegates are “working day and night in order to find the agreement that the world is waiting for.” Yesterday, Mr. Fabius announced that the Conference can expect a new draft by 1pm today. “This is not the movie world. We do not have special effects or script writers that can write a better ending. This is the real world. The World Health Organization (WHO)​ says air pollution causes 7 million premature deaths every year. We keep burning coal and oil. We keep polluting the world. I am here to say that it”s absolutely bogus and it”s the wrong way to go. There is a better way and what I am talking about is not fantasy. It is not idealistic naivety. What I am talking about is the work being done all over the world from the from the bottom up, the local and regional levels. The leaders of the world are in Paris and the spotlight is on them – it is also of course on UN Secretary-General Ban Ki-moon, President Holland, and Foreign Minister Fabius and all the extraordinary work they have been doing to secure an international agreement. We need to pick up the torch and march forward relentlessly, like a terminator. At the Caring for Climate Forum, Mr. Ban said it was time for businesses to “be more transparent, accountable &ampampampampampampampampampampampampampampampampamp responsible by supporting, not blocking, climate policy.” He also stressed that green business is good business, and that tacking action on climate change is a gateway to growth and innovation. Also present at the forum was US Secretary of State John Kerry, whom Mr. Ban met with after on the margins of the conference. The two discussed the status of the negotiations as well as the situation in Syria, and Mr. Ban reiterated the urgency for a ceasefire as soon as possible. It has been a busy morning for Secretary-General Ban Ki-moon, who has had back-to-back meeting with environment ministers from India, Mexico, Saudi Arabia and Russia. We caught up with climate action advocate and actor Alec Baldwin, who is in Paris to host the UNDP Equator Prize awards ceremony. Alec told us: “The winners inspire me and give me hope my children will inherit a better planet. Yugarta Srivastava, 19, interviews Ban Ki-moon at #EarthToParis event. The Secretary-General said “we need to show solidarity at #COP21”. “Green business is good business”, Ban Ki-moon told CEOs and private sector leaders at an event in Paris. The Secretary-General was addressing a special meeting for #COP21 of the World Business Council for Sustainable Development – a CEO-led, global coalition of companies advocating for progress on sustainable development. In Paris we have the unique opportunity to define our own destiny. Mr. Ban also emphasised that world leaders must heed the voices of civil society – including the more than half a million people who took to the streets last week all over the world – religious leaders and businesses that have expressed their support for a strong, universal climate agreement. UN Secretary-General Ban Ki-moon will open the High-Level Ministerial Event this morning at 10.40am CET (9.40am GMT, 3.40am EST). It is also important to note that Monday is ””Energy Action Day” on the Lima to Paris Action Agenda (LPAA). Accelerating global energy transition at heart of COP21 dynamic. Find out what””s happening – and how you can get involved, here. Using virtual energy generated by the actions of hundreds of millions people worldwide, the “Iron Lady”” of Paris will be illuminated as a powerful statement that we can unite to deal with the climate crisis. Led by French artist Yann Toma, this artistic installation is the largest ever virtual energy generator, involving hundreds of millions of people worldwide, everyday. It is even measuring the volume of tweets generated live using #COP21 – so the more we tweet, the brighter the Eiffel Tower will shine. The original idea was to light up the Eiffel Tower from a UN village under the monument where over 20 thousand people were to dance and bike and thus illuminate the iconic monument. But the Paris attacks of 13 November changed all that, and a large gathering was no longer feasible. So the Human Energy team put on their thinking caps and in partnership with a group of brilliant mathematicians came up with a new idea: to harness the energy of millions and not merely thousands. The Eiffel Tower will be illuminated every day until the end of COP21, generated by the number of tweets sent around the planet using hashtag #COP21. On Sunday Ban Ki-moon paid his respects to victims of the terrorist attack in Paris last month. The UN chief laid flowers outside the Bataclan Theatre, where 89 people were killed by terrorists. The attacks on 13 November left 130 people dead and more than 360 wounded. With bowed head, Secretary-General laid a bouquet of flowers in front of the concert hall. Tens of bystanders applauded the gesture with chants of “Merci, merci, Monsieur Ban Ki-moon”. Afterwards, accompanied by the Mayor of Paris Anne Hidalgo, the Secretary-General visited the nearby café “A La Bonne Biere”, where three people were killed. Drinking coffee with city officials and community leaders, Ban Ki-moon said the United Nations stood in solidarity with Paris and all victims of terrorism across the world. Environmental advocate and actor Robert Redford is in Paris to lend his support to the UN Climate Change Conference, and took part in a very special event at UNESCO today. “We need to draw attention to those that are the most vulnerable to climate change – indigenous people. “Time has run out for talking. We need to start acting. “And indigenous people can tell us how because of their close relationship to the land. Ban Ki-moon met a group of young children in a very special location today – on board to scientific exploration schooner “Tara” – a boat which has sailed across the arctic and the world. As he stepped off the boat, a journalist asked the Secretary-General about the negotiations at COP21 – he replied urging UN Member States to “look beyond your national boundaries” and have a “global vision, global solidarity”. Visit the Tara Expedition website to find out more about the Secretary-General””s visit and the awareness-raising work on oceans the Tara team are carrying out. Africa has an “enormous stake” in the success of the COP21 climate change conference, said the UN Secretary-General Ban Ki-moon on Sunday. Speaking at the African Ministerial Conference on the Environment, taking place in Paris alongside the historic summit, he acknowledged that several “key issues” remained before a deal could be reached by the close of COP21 next weekend. Mr Ban told the ministers from 54 African nations that they were a “powerful bloc” and speaking with one voice in the on-going world climate change negotiations gave them greater influence in the drive towards a deal. At this half-way point in the COP21 conference he said they were all “on track” towards a “meaningful” agreement, but he acknowledged there several key areas of concern for African countries in particular that would need to be met during final negotiations in the coming days. “Africa is particularly vulnerable to the effects of climate change,” he said, pointing out that extreme weather, economic and political fragility, meant that Africans would suffer more than most if global warming remained unchecked. In particular, he pointed to the contentious area of financing to enable impoverished states to meet their national targets on climate change. Developed countries needed to understand that investment in Africa was a “tool that helps us raise collective ambition,” he added. We start much later today, not because we are on a weekend schedule but because there has been too much going on already! This morning, UN Secretary-General Ban Ki-moon announced that a broad group of organizations will partner in 2016 to maintain momentum for multi-stakeholder climate implementation.The Secretary-General, joined by groups such as the World Bank, the Global Environment Facility and the Compact of Mayors, and individuals including Michael Bloomberg – the UN Secretary-General”s Special Envoy for Cities and Climate Change – will co-sponsor a “Climate Action 2016” summit of leaders from government, business, cities and localities, civil society and academia next 5 and 6 May in Washington, D.C.
“I am urging countries to accelerate the pace of negotiations. Nature does not negotiate with human beings. They just go to their own way. As human beings who have caused climate change phenomenon, we just have to adapt to the Nature. We do not have any negotiating power with Nature. Today is also Action Day at COP21! What does this mean? The focus is all about the ways non-state actors can help address climate change. Civil society organisations, businesses and public figures like Al Gore and Sean Penn are here showcasing climate solutions. We will have much more on this soon! To top it all, the social media platform Snapchat is giving some love to COP21 snaps with a series of fantastic filters, including one of Ban Ki-moon! Former U.S. Vice-President Al Gore speaks at the #Cities4Climate summit on 4 December in Paris. Global mayors meet at the #Cities4Climate summit on 4 December in Paris. Teaching young generations about climate change – and what they can do to mitigate its effects – is vital. So it””s no surprise that an entire day of the two-week COP21 is dedicated to education. Join the conversation on social media about how we can use education to meet the challenges of climate change using #EduDay. Discover what UNESCO is doing – and what you can do in your own family and community – here: unesco.org. Happening now at the Climate Change Conference Paris – Laurent Fabius, the President of COP21, and Christiana Figueres, Executive Secretary of UNFCCC, are speaking to the press about the status of the negotiations – and what””s coming up in Action Day on Saturday. The morning started off looking grey and blustery but the sun is coming out, and inside the UN Climate Change Conference the atmosphere is vibrant and busy. Today is Oceans Day at COP21 , and the President of Palau is at the centre of events happening in the Climate Generations zone (which is open to the public). The aim of Oceans Day is to emphasize the impact of climate change on the most vulnerable peoples and ecosystems and suggest the next steps – both within and outside the UNFCCC framework. The President of Palau, Tommy Remengesau, will speak about the profound affect climate change has on Pacific Islands, and will be joined by many other stakeholders who””ll focus on Small Island Developing States (SIDS) in particular. We””ll bring you highlights later on, but if you want to know more now, check out globaloceanforum.com and the programme. Youth participate in Day 3 of the COP21 in Paris, which featured programming on small island nations. UN Photo. Transport representatives presented 10 initiatives today that aim to reduce these emissions and build more sustainable transport systems. See the list here. The UN Children””s Fund launched a digital map to help young people tell their climate change stories. Speaking to the press in New York, Secretary-General Ban Ki-moon said: “Paris can and must deliver,” before flying back to Paris to rejoin the Climate Change Conference today.”Upon my return to Paris, I will participate in the COP 21 “Action Day” Mr. Ban said. Action Day is meant to showcase the tremendous number of climate partnerships and initiatives involving cities, and private sector and civil society. “In the global economy, the transition to a low-emissions future is well under way. In the negotiating room, there is still a lot of work to do. Key issues remain unresolved, and there is not much time left.”I continue to press developed countries to recognize their responsibility to take the lead, while urging developing countries to do more in line with their growing capabilities. Finally, Mr. Ban””s Assistant General on Climate Change, Janos Pasztor, answered questions on Reddit. Two hours that went flying by thanks to many of your very thoughtful and intelligent questions! Janos had a blast. You can read the full thing here. Secretary-General Ban Ki-moon addresses the press in NY. Young people are definitely making their voices heard today! They are all lively, enthusiastic and optimistic about the prospect of the conference. Let””s hope this holds up. The visitors”” space – Espace Generation Climat, or Green Zone – is also now fully operating. Many civil society organizations have exhibits here, showcasing sustainable solutions and sharing their vision of a carbon neutral world. We must give a shoutout to the Solar Sounds System crew who made us bike for juice – very fitting for transport day. Good morning! The sun came out today for the first time at Le Bourget since the conference started. Today is all about youth, transport and buildings. We start off with a video message from the UN Youth Envoy, Ahmad Alhendawi. Poet Kathy Jetnil Kijinerm, who comes from the Marshall Islands, recited a few lines from her poem “2 Degrees”. “2 Degrees” refers to the 2-degrees-maximum increase in global temperatures that negotiators at COP21 hope to agree on, but Kijinerm says an increase of 2 degrees will leave small island states like hers under water, and what””s needed is a maximum rise of 1.5 degrees. Kijinerm was at COP21 to take part in an event that aimed to raise awareness on climate resilience through poetry and documentary. The event included a screening of award-winning UNFCCC short film “Adapting to a Changing Climate,” which is available in nine languages. You can watch it here: unfccc.int/8889. A massive one billion dollars has been mobilized to protect the most vulnerable from climate impacts, it was announced at COP21 today. The new international initiatives will protect millions of people. The announcements were made today under the Lima-Paris Action Agenda at a“Resilience Focus” event, dedicated to building more resilient societies and economies for people who are vulnerable to climate change impacts. Click this link to read the details. Youth leaders from a number of the most at-risk countries to climate change spoke at the UN Conference on Climate Change today, calling for an ambitious and strong long-term goal which would support the countries most at risk of global warming. Sagar Aryal, 20, from Nepal, said “Growing up in the foothills of the Himalayas I was 10 years old when I realised the urgency of climate action. I began to see the mountains melt, glacial lakes flood and the human impact of the climate crisis on the 2.3 million people who depend on it for fresh water and natural resources”. Sagar and the other young people wore circles of face paint around their right eyes to symbolize “0” – zero fossil fuels by 2050, which they said is necessary to keep warming below 1.5 degrees celcius. Led by indigenous youth they then marched through the Conference site to the COP21 civil society space. It was a powerful moment – the youth voice was certainly heard today! Breaking News! 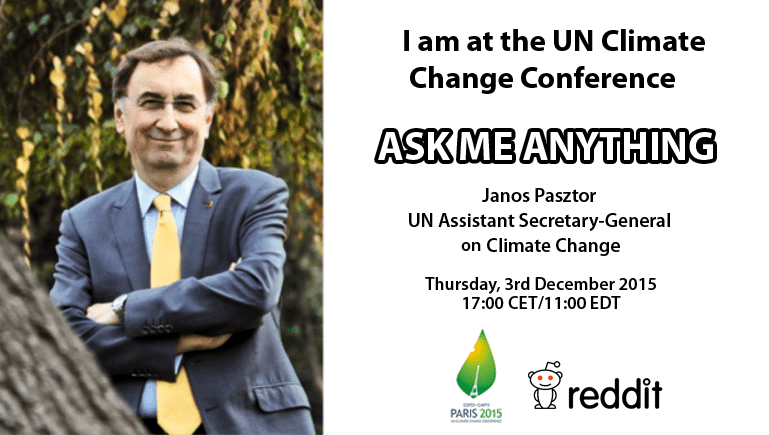 UN Assistant Secretary-General on Climate Change Janos Pasztor is here at the Climate Change Conference in Paris, and will answer your questions during a Reddit “Ask Me Anything” (AMA) this Thursday at 5pm CET/11am EST. Start thinking about your question! We also got a taste of carbon neutral chocolate, which supports an aforestation project – sounds like a pretty sweet deal to us. Paris Pact on Water and Climate Change Adaptation, which is a coalition of countries, businesses, civil society and water basin organizations to make water systems more resilient to climate impacts. The initiative has already secured $1 billion for its operation. Why is water such an important element for resilience? Climate change is causing widespread impacts on societies and economies, creating droughts, floods and warming which affect all water systems and trigger negative and often fatal impacts. Without improved water management, it is harder to achieve all the Sustainable Development Goals, which aim to end poverty and reduce inequality. Read more about the Paris Pact on Water and Climate Change Adaptation. People utilize the workspace available in Paris on 1 December. The Place to Be showcases events around Paris on 1 December. This afternoon the Lima to Paris Action Agenda was dedicated to agriculture, a sector seriously affected by climate change due to droughts, floods are other extreme weather conditions. It also accounts for 24 percent of the greenhouse gas emissions which cause climate change. Find out more about all the initiatives presented today. Germany, Norway and the United Kingdom, announced a collective aim to provide $5 billion from 2015 to 2020, if forest countries demonstrate measured, reported and verified emission reductions. 42 major companies committed under the We mean Business Coalition to remove commodity driven deforestation from all supply chains by 2020. Members of Consumer Goods Forum that represents 400 companies and commodity traders are committing to preferentially source commodities from these areas, such as through quantity or pricing guarantees. Commercial banks and private investors are committing to mobilize a specific amount of financing for land sector development in these areas. The UN Climate Conference gets going today with a High-Level event on Africa featuring Secretary-General Ban Ki-moon and several Heads of State, as well as a focus on the impact of climate change on forests and agriculture. Today is also the first day of the Lima to Paris Action Agenda, a joint undertaking of the Peruvian and French COP presidencies, the Office of the Secretary-General of the United Nations and the UNFCCC Secretariat, which aims to highlight and mobilize robust action by businesses and other non-state actors towards a low carbon and resilient societies. The Lima to Paris Action Agenda (LPAA) will go on until 8 December and will focus on 12 areas. Today the themes are forests and agriculture. The first event was opened by Prince Charles of Wales, who called on accelerate action to protect and sustainably manage forests. Ban Ki-moon discusses climate change on 30 November in Paris. UN and French leaders shake hands in Paris on 30 November. Ban Ki-moon holds a climate meeting on the first day of COP21 in Paris on 30 November. Ban Ki-moon makes his way to a meeting at COP21 on 30 November. World leaders hold a panel at COP21 in Paris on 30 November. World leaders discuss carbon pricing on 30 November in Paris. World leaders pose for a photo on 30 November in Paris. The press awaits world leaders at COP21 in Paris on 30 November. A panel gets ready to begin at COP21 in Paris on 30 November. Ban Ki-moon meets actress Marion Cotillard at COP21 in Paris on 30 November. Ban Ki-moon meets an indigenous leader 30 November at COP21 in Paris. The halls of COP21 are ready for visitors. Listen to a roundup of our coverage here. It has been an afternoon heavy on press briefings and panels. Mr. Ban launched a new initiative to strengthen climate resilience of the world”s most vulnerable people, which focuses on early warning-early action systems, insurance, and increasing investment in bid to accelerate climate resilience efforts. Indian Prime Minister Narendra Modi, along with French President Francois Hollande and Secretary-General Ban Ki-moon, then launched a solar alliance initiative of over 120 countries to boost the use of durable and clean energy. In a remarkable show of unity, six Heads of State – Canadian Prime Minister Justin Trudeau, Chilean President Michelle Bachelet, Ethiopian Prime Minister Halemariam Desalegn, French President Francois Hollande, German Chancellor Angela Merkel, and Mexican President Enrique Peña Nieto, called on the world to start pricing carbon pollution to address climate change and transform the global economy. Other news at the opening of COP21 included a pledge by 11 donor countries of close to $250 million dollars in new money for adaptation support to the Least Developed Countries Fund (LDCF), a climate fund hosted by the Global Environment Facility (GEF). A new Fossil Fuel Subsidy Reform Communiqué was presented to Christiana Figueres, the Executive Secretary of the UN Framework Convention on Climate Change (UNFCCC), by the New Zealand Prime Minister John Key.The Communiqué calls on the international community to increase efforts to phase out perverse subsidies to fossil fuels by promoting policy transparency, ambitious reform and targeted support for the poorest. In addition, the World Bank announced it has been working with four European countries – Germany, Norway, Sweden, and Switzerland – to set up a new $500 million initiative that will find new ways to create incentives aimed at large scale cuts in greenhouse gas emissions in developing countries to combat climate change.The initiative, called the Transformative Carbon Asset Facility, will help developing countries implement their plans to cut emissions by working with them to create new classes of carbon assets associated with reduced greenhouse gas emission reductions, including those achieved through policy actions. The Leaders event is well under way, with the first remarks being made by President Francois Hollande and Secretary-General Ban Ki-moon. Mr. Ban strongly urged the 150 Heads of State – the largest gathering of world leaders ever outside the UN – to show leadership, courage and vision to reach an ambitious agreement. “We cannot afford indecision, half measures or merely gradual approaches. Our goal must be transformation,” Mr. Ban said. We are off to an early start! Lots of activity (and long coffee lines) as early as 5:30am at the Le Bourget conference centre. 150 Heads of State have been confirmed to be in attendance, over 180 countries have submitted national commitments covering close to 100% of global emissions. Welcome to our live blog of the UN Climate Change Conference, also known as COP21. For the next two weeks we will share highlights here from the heart of what will be one of the biggest climate conferences ever. The conference starts on Monday, but already the huge COP21 site – Le Bourget, on the outskirts of Paris – is buzzing with preparations for the historic opening day. Delegates, journalists, business and civil society representatives, UN staff and all the people working behind the scenes are running around getting their accreditation and security passes, checking out meeting rooms and setting up interactive spaces for the big day when more than 140 Heads of State and Government will be here to share actions they will take to tackle climate change with a global audience. COP21 will officially open at 10am CET by the President of France, Francois Hollande. You can watch all the proceedings live from here. UN Secretary-General Ban Ki-moon has arrived in Paris, and will address leaders tomorrow at 11am CET. This morning he met with leaders of civil society, and he also donated his “marching” shoes to stand in solidarity with the people of Paris who were unable to join a climate march today. The shoes were placed at the city”s Place de la République, near the scene of the terror attack of Friday 13 November, and where the climate march originally planned for today was due to start. The thousands of shoes contributed were donated to NGOs working with Syrian refugees. In the evening Mr. Ban attended a ceremony to launch the One Heart One Tree, a collaborative artwork which will transform the Eiffel Tower in a forest of light. Also in attendance were advocate of indigenous issues, Chief Raoni of the Kayapo people, and French actress Marion Cotillard.